Superficially, Aluminum Babe seems to be a DIY-driven, fierce frontwoman-powered electro outfit making music suitable for garages and house parties. In theory, they seem to be the type of band that has a well-honed demographic and probably fills a solid niche. In reality, they’re all over the electro map, and their extremely long sixteen-track album, 17, is wildly a hit or a miss. 17 kicks off to a fairly solid start with “Infatuation.” Propelled by amusing basslines and synths and kept afloat by urgent vocals and stock dance beats, “Infatuation” might be pretty basic electro fare, but it’s done well. Come track two, however, Aluminum Babe sounds a little too much like Asobi Seksu, and track three is an absolutely horrifying rendition of Talking Heads’ “Psycho Killer.” If one is going to cover a David Byrne song, one had better do it well, and Aluminum Babe’s version is not well-done. The rest of the disc continues to venture into different territories like a multi-headed songstress with no concept of what direction she wants to head in. Beyond the first track, most of the album is like a weird mixture of Ladytron meets Asobi Seksu — only not in a good way, but more an annoying one. Some tracks, like “Restart the batteries” and “Best friends,” hold promise in the form of intriguing percussion and guitarwork, but ultimately fall short because of bland vocal vomit. Two-thirds into 17, the music actually starts to become interesting again. “If you like it” features layers and layers of distortion, wails, and miscellaneous sounds that strip away one by one until only vocals remain, and “Dangerous” stands out by venturing into nearly industrial territory with wickedly dark grinding synths. The album closes out with three remixes of the opening track, “Infatuation,” and all are rather different, with “Infatuation 1” being a house or dance remix, “Infatuation 2” being a breakbeat remix, and “Infatuation 3” being an experimental remix. One can’t help but wonder why Aluminum Babe would throw all three remixes onto the album, though, as they feel out of place despite being solid on their own. In fact, why the band would include sixteen tracks on 17 to begin with is a mystery; had they cut the number of tracks in half, Aluminum Babe would have a much better and more cohesive album on their hands. As it stands now, the disc becomes worth listening to much too late. Most of the tracks on 17 begin with some originality but drag on too long or just take a nosedive into lameness. 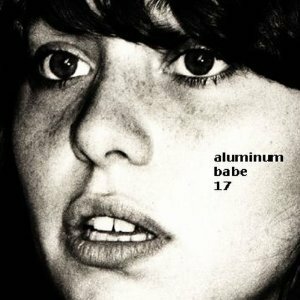 But if listeners can make it through the bumbling and unfocused beginning two-thirds of the album, Aluminum Babe might be worth something. If not, 17 features electro that’s pretty much as boring as the genre can get.